“Magic: The Gathering” is a popular trading card game that has been around since 1993. Being one of the first of its kind, it became like a grandfather of other card games to come like “Yu-Gi-Oh!,” “Pokemon,” and “Hearthstone.” There are very few people who haven’t heard of the game, and those who have played it will always end up discussing the importance of art. Whether it is art related to a story, a personal preference of art, or any number of discussions, because the art is so prominently, it is no doubt one of the most important aspects of the card. 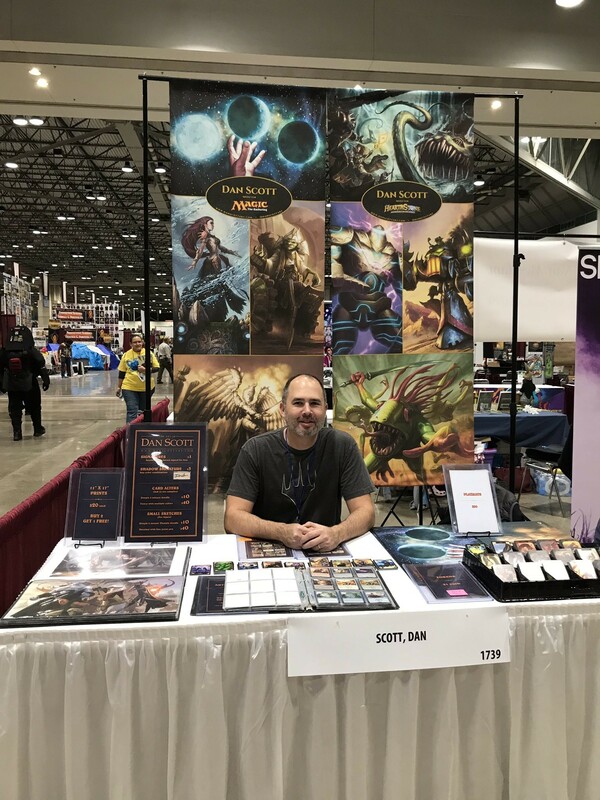 At Planet Comicon, we got to sit down with Dan Scott, an artist who graduated from the University of Central Missouri, who does art for “Magic: The Gathering.” He gave us some insight into what it was like to create the art and what he would say to those who aspire to be in his position. We began by asking Scott what his journey has been like in between graduating from UCM and ending at his goal as being an artist for Wizards of the Coast, the publisher of the “Magic: The Gathering” card game. Artwork for the Jeskai Ascendancy “Magic: The Gathering” card. Scott worked the gamut prior to his job at Wizards of the Coast, ranging from smaller card games to video games, his experience made he well-rounded. Scott said his process starts small scale and builds in multiple layer to what “Magic” players find on their cards. “I’ll do a really rough sketch, kind of a thumbnail, to get a base for where all the elements are going to be laid out,” he said. “I’ll then make a non-repo blue layer, which is just a color saturation layer where that rough sketch I did is shown very lightly in the background and I’ll make a new layer and do a detailed sketch over the top of that, kind of like what you see in comic books. 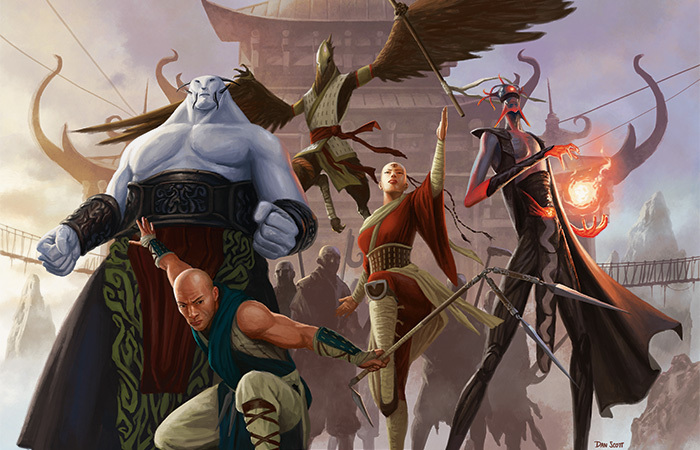 Scott offered some advice to artists wanting to work their way into the business of designing cards or art for a company such as Wizards of the Coast. 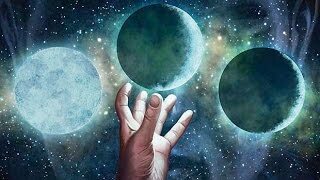 Although he never gave an answer to the question of what his favorite art is that he’s work on, personally, I’d have to say that my favorite is his work on the MTG card, “Ponder.” He told us that he spends around 30 hours on each piece, so after spending so much time he likes them all. Getting a chance to meet someone who works on a card game that I, along with many other people, enjoy was truly a great experience. Dan shows that you can achieve your goals, as long as you are willing to keep trying. Between Dan Scott, the Artisan Rogue Mario Mora and Brandi Stone at Dorky Dino, it shows that there’s a lot of talent to come from the University of Central Missouri and we enjoy seeing each one of them at the conventions that we go to. Be sure to follow Dan on Twitter and on Facebook to see more of what he has to offer.